Note: All pictures on this page have been supplied by our guests! Thank you! Kerstin and Udo' s place was very zen. The pictures don't do it justice. You really feel like your part of the jungle. I will definitely be back. The outdoor bathroom was my favorite part. The Orange House was fantastic! The outdoor bathroom was my favorite part. Kerstin&Udo keep a beautiful property with a sparkling infinity pool. This area of Costa Rica is very nice, with many good restaurants and beaches. one of our very favorite Airbnb stays. We had a wonderful stay at Kerstin&Udo's Orange House. This lovely house is one of our very favorite Airbnb stays. It is charming and artistic, perfectly sized for two people. It is completely private, in a mountainside garden setting with toucans and startlingly lovely birds. The longer you relax on the open patio watching and listening, the harder it is to get in your car. When you do, a gorgeous beach is 5 minutes away, as is the quiet town of Uvita with several restaurants and many outdoor activities. We loved Costa Rica, it is indescribably beautiful and rich with nature, and Uvita is worth the small effort to reach it. You definitely need a car, preferably 4WD. The hosts were warm and accommodating and we highly recommend this delightful place. Nous avons appr�ci� notre s�jour � la maison orange. Nous n'avons pass� que deux nuits � cette endroit, mais la villa est tr�s propre, la salle de bain ext�rieur fut un coup de c�ur pour nous et Kerstin et Udo son des h�tes tr�s disponible. Petit mal entendu sur l'heure de d�part (am/pm) mais aucune cons�quence en lien avec la situation. Tr�s beaux s�jour!! Das war die sch�nste Unterkunft �ber Airbnb. Traumhafte Unterkunft die jeden Cent wert war. Kerstin und Udo waren sehr hilfsbereit und freundlich. Das war die sch�nste Unterkunft �ber Airbnb und es ist toll, dass es Orte wie diesen gibt. Das Bad war gigantisch mit der Dusche im Freien. Die K�che war super ausgestattet und Kerstin hat sogar ein paar Fr�chte f�r uns bereit gestellt. Der Pool ist toll! Von da aus haben wir sogar einen Tucan sehr nah gesehen. Wir haben uns sehr wohl gef�hlt und kommen gerne wieder! Definitely a wonderful place to stay! We loved staying and Kerstin and Udo's place! The pool and views were amazing and we loved being close to all the beaches but not right in the middle of all the activity. Definitely a wonderful place to stay! Kerstin even had some homemade bread and jam for us when we arrived! It was a wonderful trip! Un petit paradis, il y a tout ici pour se sentir bien et surtout seul. Uvita est � 1 km pourtant!!! c'est tout simplement une merveille, la seule chose n�gative c'est qu'il faut repartir. Bravo aux h�tes pour cet �tablissement, en deux mots c'�tait MAGIQUE. A little paradise, there is everything here to feel good and alone. Uvita is 1 km away !!! It is simply a wonder, the only negative thing is "you have to leave". Congratulations to the hosts for this house, in two words it was MAGIQUE. Very nice house with a beautiful bathroom. My wife and I had a tranquil stay at Kerstin and Udo's guesthouse, never once feeling out of place or at a loss for personal security. Stay for a week, watch and learn how each phase of the day highlights the intricate details of nature and architecture. We would recommend their place to anyone. We just returned from a weeklong stay at Kerstin and Udo�s beautiful home. Tucked away from town, it offered the peaceful seclusion that we were seeking while still being only minutes away from a market, bank, restaurants and beaches. My husband and I never once felt unsafe or that the house was unsecure. Kerstin and Udo were gracious hosts, making us always feel welcome and providing a wealth of information on what to do in the area. We would recommend their place to anyone and hope to one day return there ourselves. The Orange House is absolutely fabulous! It was very relaxing being there and close to a lot of activities. Definitely recommend to anyone wanting a beautiful place to stay that is secluded yet close to a lot of places with lots of things to do. The Orange House is a purely exceptional place. The Orange House is a purely exceptional place to visit and if you are iffy about it at all, you have no reason what so ever to doubt it. Although my girlfriend and I were only there for a few days, we spent our last days here and they were our best because the house was extremely well prepared, clean, very tranquil, beaufitful and most importantly both Udo and Kerstin were very welcoming and helpful with anything we asked of them. I can't wait for the next time I am able to visit Costa Rica because I will definitely stay at the Orange House again, if there is any available spots left. This all being said the pictures on airbnb don't do it justice so go ahead and book it because you won't regret it! very tasteful, modern, minimalist design and decor. The Orange House was beautiful with a very tasteful, modern, minimalist design and decor. I loved the lush outdoor bathroom/shower. The house was so tranquil, looking out over the valley to the ocean. The infinity pool was really nice and I loved the landscaping throughout. Kerstin and Udo had many nice touches like leaving a loaf of bread, some fruit, and homemade tropical fruit jam for us. They kept a phone in the Orange House so that we could reach them easily as well as use the phone for local calls. They are extremely organized and run a well-managed operation. I wish I could have stayed longer to soak up the beauty of their property as well as Uvita. Kerstin & Udo were incredible hosts! The were very detailed with the driving directions, making it very easy to get to their place (I do recommend a 4X4 vehicle for this area!) and were always quick to respond to any questions. Their place was absolutely beautiful. I saw the photos and great reviews about the outdoor bathroom, but it still exceeded my expectations. They thought of every little detail in this home and made it perfect. If we get a chance to come back to Costa Rica, this place will certainly get another visit. We really got a "wow" feeling. We absolutely loved everything in and around the Orange House! We really got a "wow" feeling when we arrived & the house is more spacious then it looks on the pictures. Such a wonderful experience to stay here a week...(if only it was longer!) The design of the house, the use of the space, the decorations, the good bed, the amazing outdoor bathroom, the terrace, the possibility to make the house "open", a practical kitchen, the big green garden, the beautiful swimming pool, there's really nothing not to love! This is a GREAT airBnb property. We had a wonderful stay at The Orange House. We had a wonderful stay at The Orange House. Everything was as described. We couldn't have asked for a more beautiful and relaxing property on which to end our trip in CR. Waking up to toucans and monkeys in the mornings was icing on the cake! Kerstin & Udo were kind enough to help us arrange transportation and guide us (our taxi driver) in upon our arrival to Uvita. Be sure to use the driving directions even if you aren't the one driving! We would recommend this place to anyone in a heartbeat! Great hosts and beautiful place to rest! The outdoor bathroom was special. We had a wonderful stay at the orange house! Kerstin and Udo were such kind hosts - they made sure to provide great directions and greeted us upon arrival (with breakfast for the next morning!). The house is beautiful, and like many have said, it feels quite spacious once you are settled due to the creative design. The outdoor bathroom was special. We especially loved feeling "off the beaten path" and not being surrounded by tourists. We enjoyed spending most of our days on the surrounding beaches and in Dominical (great surf town with delicious restaurants - we are vegan and had a plethora of options which was unexpected and exciting). All in all, we loved our stay here. Very nice and quiet place, we enjoyed our time! Kerstin and Taifun the dog were at the gate to greet us upon our arrival. After going through the house and grounds, the space was essentially ours for the duration of our stay. Kerstin and Udo provided some food and fruits, as well as clean towels. We felt very cared for, and it is clear that Kerstin and Udo truly value their guests. Despite our "rainy season" vacation, we welcomed the variable weather -- which can be fully enjoyed in the open-air layout of the home. We would highly recommend staying at Kerstin and Udo's... we hope to do it again! This place is amazing. My wife and I spent our honeymoon here and couldn't have been happier. Kerstin and Udo were so friendly and welcoming, and super easy to communicate with. Check in/check out was a breeze. We rented a car so they provided an electronic key to open/close the gate to the property. We felt safe and extremely comfortable at their place. The house is entirely secluded and surrounded by beautiful gardens. We loved opening up all of the sliding doors and listening to the sounds of nature that surround you there. We were very comfortable with the fan on at night, and the outdoor garden bathroom is heavenly. As stated in the listing, we had the pool all to ourselves, and really enjoyed watching the sunsets from that spot. Kerstin had fresh fruit from the garden and a lovely loaf of bread waiting for us when we arrived. We were able to store food in the refrigerator and didn't have any problem with bugs. The guest information that they provide is so comprehensive and helpful. They have tons of information about the surrounding area; restaurant recommendations, things to do, places to go, etc. We stayed busy and still weren't able to fit it all in. The location is great...very quiet and peaceful, but still just a few minutes from town. We miss this place already and would return in a heartbeat! Kerstins and Udos place was so beautiful. The gast house was very cozy and it was located in such wonderful land/property! The value was unbeatable and they made sure to go above and beyond to make your stay so much better! We had rented a car and the car broke down in Bahia and I had to take a ride back to the house to ask for help and ask them if they could drive me back as the car and my gf were stranded. They did not hesitate and offered me a ride!! They were so humble and so friendly! This place is highly recommended!! Cheers y Pura vida! Communication was excellent! Uvita's orange house is wonderful! I won't be very original... Uvita's orange house is wonderful! Such a great stay in this house which is bigger than the pictures let appear. Udo and Kerstin welcome you very nicely and prepare everyting with fruits, coffee, milk, jam, bread... for the first breakfast. The place is beautiful: the house, the outdoor bathroom, the terrace, the garden and the amazing pool! Un petit paradis... Allez-y les yeux ferm�s! Kerstin and Udo were fantastic in making myself and my girlfriend feel more than just welcome in their home. Prior to the trip they had some excellent suggestions and advice regarding preparation for the trip which was very helpful. The property itself is absolutely incredible. The pictures look amazing but they don't nearly do this wonderful property justice. The open style living is one that I was perhaps a little hesitant about at first but the immersive home makes you feel so much more connected with the nature and wildlife they surrounds this property. As expected, there are lots of bugs around but if this worries you then the mosquito net around the bed should help you to feel more comfortable during the night. The huge and diverse garden is a big plus for this property. It felt wonderful each morning to be woken by natural light and then to open the large sliding doors to have breakfast looking out to the garden. The pool is equally brilliant. The ocean view is a little distorted by the continued growth of trees but it is still breathtaking. It felt good to start each day with an early morning swim and then to have an early evening dip again after a day of activities in the heat. Something mentioned often by others is the garden bathroom - it really is something that completely separates this property apart from any other I have ever seen. You really just have to see it... The Uvita area itself is very small but it felt very safe. We did not hire a car for our trip to Costa Rica and had little to no problems in getting around. He taxi service (we recommended Hermes) were more reasonably priced but I would recommend you read up a bit on basic Spanish. 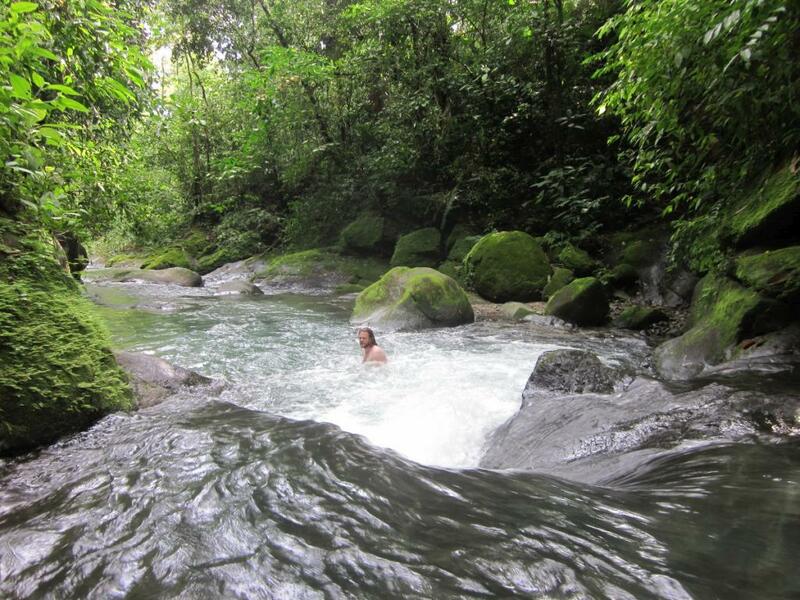 The waterfalls (Uvita and Nauayca) were great fun and absolute must do's for any visitors to Uvita. 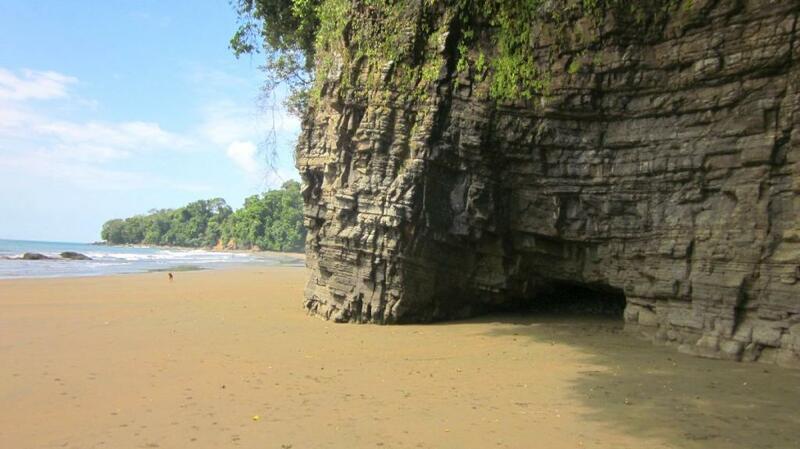 There are also a number of beautiful beaches around with our favourite being Playa Hermosa. I can't recommend Kerstin and Udo enough. Were we to visit Uvita we would absolutely love to stay here again. This place was everything we could have asked us and more. The host was ready for us as soon as we had arrived, and had even reached out to us ahead of time to coordinate arrival. Udo immediately gave us a tour of the house, as well as instructions on how to use everything in it. He also provided a phone so we may make local calls for dinner reservations. House was spotless, and impeccably designed. The house contained a binder with information regarding the local area, which was a huge help in order to make plans. The view was amazing from the hammock and outside deck, and made everything extremely relaxing. They coordinated with a neighbor to assist with check out since we were leaving so early, which was very helpful. This place was everything we could have asked us and more. So close to the beach and restaurants, with a supermarket nearby as well. The orange house is true paradise. The property is stunning - open spaces with fauna and flora everywhere. We had a car which was helpful to travel up and down the coast, but this location would be great if you wanted to completely relax and stay on the property. The orange house is absolutely beautiful! The orange house is absolutely beautiful! The attention to detail is very impressive. It was impeccably clean, and a nice quiet location. all the recommendations from kerstin and udo were wonderful. A side note for those who are a bit squimish About bugs, keep in mind this beautiful place is in the middle of the rainforest, there will be bugs in the home. Also the bathroom is outdoors. As long as you are ok with that you will love this rental! Perfect romantic getaway..
We had an amazing, magical adventure staying in the Orange House. You truly feel like a friend staying in your family's guest house. Kerstin and Udo are the nicest people ever. Even though they give you complete privacy, they make sure you are happy and enjoying your stay. We loved the home and we loved the pool. It was the second leg of our vacation so we mainly spent it relaxing by the pool for most of the mornings, then we would go into town. It's really inviting on a hot day. The orange house seems small when you first walk up to it, but the use of space is ingenious and the ceilings are so high, that once you are settled in it feels very spacious. The hammock is excellent for an afternoon snooze. The kitchen has all the utensils you could need, the knives are nice and sharp, and the "breakfast kit"'of homemade jam, bread, etc is a lovely touch. You truly feel like a friend staying in your family's guest house when you stay here! It was wonderful and we would love to visit again in the future. found the orange house esthetically pleasing. We had a fantastic time in Uvita! My daughter and I found this area of Costa Rica satisfied both our varied interests and pleasures. We both found the orange house esthetically pleasing, for all the senses. Thanks to Kerstin&Udo! Jack. This small guesthouse is gorgeous. This small guesthouse is gorgeous and very thoughtfully laid out with marvelous built-ins, a well-furnished kitchen and great privacy. The hosts were helpful and the guesthouse was scrupulously clean. There was a mosquito net over the bed for those that prefer one. The high exposed ceiling structure made the little house feel very spacious compared to its actual floor area. The parking and entrance area is well screened from the road and neighbors. The enclosed outdoor bathroom was an absolute delight and well secluded. The furnishings, artwork and accessories were all thoughtfully chosen. The pool at sunset is not to be missed. The location is very convenient to beaches and restaurants. It's up in the hills but a short easy drive compared to other locations we have stayed at in the Uvita area. The high quality of the design is a remarkable find for Costa Rica. We would head back here without hesitation and strongly recommend it to others. It does not have an ocean view. the garden shower is really awesome. My wife and I loved staying here where the hospitality was very warm and the house was located close to the beach. Kerstin and Udo had great suggestions for beaches, restaurants etc. The house itself was a great design with many cool features, such as the front porch hammock. I laid in it every morning listening to the birds and monkeys drinking my coffee. As everyone else has mentioned, the garden shower is really awesome. I plan on building one at my house. The house and garden and pool are all gorgeous. We absolutely loved our stay. It couldn't have been better. The house and garden and pool are all gorgeous. The outdoor bathroom was amazing. Falling asleep to the sounds of nature was wonderful. I'd love to come back here. The orange house is architecturally stunning creating a seamless balance between indoors/outdoors. The property is also amazing and the surrounding jungle provides the perfect back drop to view the sunset from the infinity pool. Kerstin & Udo's attention to detail is impeccable and they were wonderful host. The native fruit they provided from their garden and homemade tropical jam was delightful. My favorite part of the house orange house was the outdoor shower. I would definitely recommend staying at this place! I can't say enough good things about their place. Kerstin and Udo welcomed us heartily. They had our fridge stocked with homemade jam, fresh bread, and eggs for the beginning of our stay. They have created an amazingly well designed and comfortable place. The setting is secluded and beautiful. You wake up in the morning to the sounds of nature and a beautiful view. Their convenient and lovely outdoor shower and toilet are awesome. They welcome guests to swim in their lovely infinity pool by their own home. We'd love to come back and stay longer in their wonderful retreat. I can't say enough good things about their place. The Orange House was absolutely fantastic and our favourite accommodation of our entire trip and Kerstin and Udo were terrific hosts and lovely people. The house is as beautiful as it appears in the pictures. The thoughtful design creates a warm and comfortable space within the house and the open concept allows you to take in the views that surround it. For those reading this who are wondering about the surrounding area, the house is perfectly situated to take advantage the great dining in Ojochal to the south and the great surfing in Dominical to the north while all the while being only minutes from the famous National Park and "whale tail" in Uvita. We will definitely return to the Orange House on our next visit to Costa Rica. Thank you Kerstin and Udo! Wir haben uns richtig wohl gef�hlt in dem wundersch�nen, sehr geschmackvollen und sehr sauberen Haus von Kerstin und Udo! Hier waren wir wunschlos gl�cklich! Kerstin und Udo sind sehr nette und unkomplizierte Leute, die uns verw�hnt haben, mit allem, was das Herz begehrt! Der Pool mit sch�ner Aussicht, die originelle Freiluftdusche, der Garten, die V�gel, ...wie im Paradies! Und nicht zu vergessen, das sehr bequeme Bett! Wir k�nnen diese Unterkunft w�rmstens empfehlen! Danke Kerstin & Udo!! We had a wonderful time at the Orange House. The design of the bungalow and grounds is beautiful. It's a perfect balance of modern amenities combined with tropical simplicity. Toucans, geckos abound and waking each morning to the chorus of Howler Monkeys was a fun experience. It's hard to pick, but one of the favorite features is the outdoor shower. It's hard to believe but this home is every bit as beautiful and amazing as the pictures. Over and over again during our stay, I had to comment on how hard it was to believe that I could have access to such a luxurious and romantic place. The home itself is very private. The bathroom is out of this world. Showering under the stars surrounded by plants and flowers is just a magical experience. We loved sitting on the front porch in the evenings. The lighting is romantic and perfect. The ceiling fan is very powerful and we had no issues with bugs or heat. It was surprisingly cool even when the daytime temperatures in the area reached 104 degrees. The pool was amazing. We would take our drinks up there and watch the sunset. We also went each morning. If you are trying to decide between a place with a pool and one without one (I was), definitely choose here with the pool. It gets hot and the ocean water is warm; having a cool, clean pool to dip in each day makes a huge difference. Kerstin and Udo were very friendly and helpful - giving us privacy while also helping with any needs. Their own home (which the pool is in front of) is impressive and inspiring. This really was paradise and I would recommend it in a heartbeat. This is paradise! First of all Kerstin and Udo are perfect hosts they leave you alone but are always around the corner to help you and give you tips. They provide great binder with info off stuff to do. They clean the house and and provide clean towels and also mutiple towels for shower, pool and beach. And last they give you a phone for local calls and also 220 V.
The house was bigger than I expected when I got into it. It has everything you need for 2 persons. We cooked dinner at home everyday the kitchen had everything you needed from pans to spices (I'm very picky in the kitchen). The outdoor bathroom was my favorite, loved walking out there in the morning for showers and so on. The patio was big n gave great shades from the sun but for sun lovers you just havce to walk to more steps and you have awsome grass terrace. Wifi was fast and there was more than enough storage for 2 people who travell for 2 weeks. Last of all don't forget to catch the sunset from the pool with a nice drink in your hand! I would recommend the orange house to everybody! But you kind of need a car (4x4 is recomended)! the perfect place to spend our honeymoon! The orange house was the perfect place to spend our honeymoon! We could not have enjoyed this little paradise more. The house was modern, convenient, and in mint condition. By far our favorite part was the pool- incredible views! Thank you to Kerstin and Udo for providing everything we needed and more for the perfect trip to Costa Rica! Alles perfekt. Ein wahrer Urlaubstraum! Beautiful house and secluded property. Beautiful house and secluded property. Very simple but not much is needed in paradise. Clean and spacious. Kerstin and Udo are helpful and their suggestion book has good recommendations. We strongly suggest watching the sunset at PorQueNo? Food and view was outstanding. Costa Rica is extremely hot so be prepared that house does not have air conditioning and only a ceiling fan which is fine especially at night when it cools down. Also, take their advice and go food shopping prior to visit so you have snacks and beverages including water since you can't drink tap. The grocery store in town is pricey and limited with options. Overall we loved it. Beautiful simple option in paradise. This house is exactly what the listing and reviews say, and more! Pictures just don't do it justice. Kerstin and Udo are a lovely couple that make you feel welcome and give you everything you need to have a great stay without getting in their way. Their pool was the highlight for us, such beautiful landscape surrounding it! The towns surrounding the house are perfect for exploring and feeling like you're part of the local life. Highly recommend checking out Playa Ventanas and also Exotica restaurant, both things they pointed out in their guidebook. Overall, fantastic stay and highly recommend to anyone considering!!! Wow, what a beautiful place! After trying to navigate the roads at night and being very tired from a long day of travel we finally reached the Orange House even though we arrived very late!! Trust their perfect directions! We, unfortunately, did not get to meet Kerstin as she was out of town but Udo was a most perfect host and was so welcoming. Udo and Kerstin excel in hospitality. Thank you also for the wifi. It was the best way to stay in touch at home. We loved the outdoor, jungle like bathroom!! So unique. I spent a lot of time at the pool....it was he perfect way to relax. So peaceful!! I will definitely recommend The Orange House to family and friends. It's the perfect location with so much to offer in great restaurants and friendly people! sehr gelungene Symbiose zwischen Architektur und nat�rlicher Umgebung. Eine tolle Unterkunft auf dem Grundst�ck der Gastgeber. Kerstin und Udo haben sich in jedem Belang um uns gek�mmert. Swimming-Pool konnte genutzt werden. Bei der Ankunft fanden wir Brot und weitere kleine St�rkungen f�r den ersten Hunger vor. Toilette und Bad befinden sich in einem (eingez�unten) Au�enbereich. Sehr reizvoll. Die Unterkunft bietet insgesamt eine sehr gelungene Symbiose zwischen Architektur und nat�rlicher Umgebung. Perfect! Amazing! Flawless! Unbelievable! Heaven on earth! Beyond all expectations! Perfect! Amazing! Flawless! Unbelievable! Heaven on earth! Beyond all expectations! Even more spectacular than the pictures. It's truly hard to put into words how incredible, blissful and beautiful this place is where nature coexists with life and inner peace is reflected in the openness. It was a paradise that it seemed to be created just for us from the infinity pool with the amazing view, gazebo with a calm resting space in the shade, stone trails to get to and from (with bamboo walking sticks provided on cue), outdoor shower and bathroom, windows and doors letting the sun and beauty in, Eco-friendly features, cozy bed and furniture, outdoor table (perfect for our long brunches), relaxing hammock, vast yard with beautiful flowers and jungle, privacy, the list can go on and on. Kerstin and Udo were perfect airbnb hosts (and we adored their dog too). From the start of our conversations, they were excellent communicators. She even provided us with a discount code for National Car Rental. Thank goodness we rented a 4 by 4 as she recommended; it was definitely needed. They were able to answer all of our questions and provided a nice packet with useful information from details on the Orange House to info on restaurants and activities. It was also fun to chat with them here and there as we crossed paths. Other small touches helped make this stay more pleasurable such as the local cell phone they provided us to use and a built-in safe box. The kitchen had everything we needed to be able to make some of our meals. The striking and delicious fruit basket was a wonderful welcome along with homemade tropical fruit jam and fresh eggs. The local grocery store in town (few minutes away) was great too. Plenty of great restaurants close by. We are so glad that we stayed here for a week. We already have several friends that will be looking into a trip to Costa Rica and to stay here. I know that we would love to come back. We wanted to go somewhere for our honeymoon where we can just focus on each other and enjoy our surroundings- and this was just perfect. Thank you so much Kerstin and Udo. We are very happy (and jealous) that you get to enjoy this all the time. Thank you for letting us into the orange house; we feel very honored. The Orange house really is lovely. Kerstin & Udo were wonderful hosts and made us feel very welcome. They were readily available to answer any questions. The Orange house really is lovely. It has a lot of privacy, the only thing you will hear is the sound of birds and howler monkeys (especially in the morning!). I hope we can make it back to Costa Rica soon and will definitely stop by the Orange House again! My wife and I had a wonderful experience staying at the Orange House. Eco-minded, clean, and aesthetically beautiful, the house was just what we were hoping for. Every detail was accounted for, and every question had an answer. Kerstin and Udo even provided us with fresh fruit and a homemade marmalade as a welcome gift. Perfect! Our stay at the Orange House was amazing! Our stay at the Orange House was amazing! The house and gardens are beautiful - we especially loved the outdoor bathroom! And the view from the infinity pool was pretty great as well! The information manual in the house was great and we spent the day exploring the beaches. Our only disappointment was that we didn't stay for longer!!! Kerstin and Udo were great hosts and we definitely want to come back again! Das orangehouse von Kerstin und Udo ist ein absoluter Traum. Es hat uns an nichts gefehlt und unser pers�nliches Highlight war die Dusche in der freien Natur. Kerstin und Udo sind in allen Belangen sehr hilfsbereit und haben tolle Tips, es man in und rund um Uvita alles erleben kann. Allerdings m�ssen wir sagen dass eine so tolle Unterkunft eher dazu einl�dt zu entspannen und die Seele baumeln zu lassen. Wir sind froh diese Unterkunft gebucht zu haben und w�rden jedem der ein paar Tage Ruhe sucht das orangehouse empfehlen. We stayed in Kerstin & Udo's stunning Orange House for the first half of our honeymoon. I can sum it up with, it was a complete dream. On multiple occasions I looked at my new husband and said "Is this real life?" If and when we are in this corner of the world again we will surely stop to stay with Kerstin & Udo again. Hands down, coolest bathroom/shower ever. Not that this should be a deciding factor when you're in Costa Rica, but the Internet was fantastic. It was fun to have a movie night and be able to stream Netflix. Also, still thinking about Kerstin's homemade jam...delicious! Udo forwarded us an email from a restaurant about fresh tuna and a BBQ they were having and it was amazing! They are perfect hosts with a just right balance of friendliness but also giving you privacy. I have and will continue to recommend Orange House to our family and friends! Thank you Kerstin & Udo! ... wish that we had spent more time here in Uvita during our trip. We loved our stay here and wish that we had spent more time here in Uvita during our trip. Kerstin and Udo were very welcoming and had thought of every detail of how we could explore the area. The fruit and snacks they had waiting for us lasted the length of our stay and were greatly appreciated. The pool, property, and views are amazing. We couldn't have been happier with our vacation. What a great place to stay and relax as much time as your schedule permits. We spent 4 nights and we wish it was even more! The Orange House is so beautiful and comfortable that you won't need to go to any beach. Every detail is designed with tons of love. The swimming pool and the view from up there are also amazing. Kerstin and Udo were always very kind and supportive all the time we needed them. Thank you both! You're so great! We loved your place. Hope to come back soon! We absolutely loved our stay in Uvita with Kerstin and Udo. The property is gorgeous and incredibly functional and self-sustaining (all designed by Kerstin who is an architect!). The pictures do not do this place justice! The grounds are so beautiful--the hammock, the pool, the amazing outdoor bathroom... We truly relaxed and enjoyed the peacefulness of the jungle. We were greeted by Kerstin, Udo, and their sweet dog-Taifun. Upon arrival we were given a delicious starter breakfast, complete with Kerstin's amazing homemade jam and fresh fruit. Kerstin and Udo were very helpful during our stay. If you are considering visiting Uvita and are looking for peace, serenity, and complete relaxation you will love the Orange House. We can't recommend it enough! If you're looking for an amazing, private place to stay in Costa Rica, Kerstin&Udo's Orange House is highly recommended. My wife and I stayed here in June 2015 and absolutely loved our stay. Upon our arrival, Kerstin gave us a quick tour of the house and then gave us our privacy for the rest of the stay. We soon encountered a pair of toucans and much more wild life which made our stay all the more exciting! The house has all the modern amenities and we enjoyed cooking in the well equipped kitchen. We also loved the modern styling and the outdoor shower. All of it was amazing! As other reviews mention, the fresh fruit, the homemade jam & the bread were just such an excellent welcoming touch. A folder with all the local attractions and the host provided cell phone made planning activities in Uvita a breeze. Everything about the Orange House was above and beyond excellent. We felt truly spoiled with this bed & breakfast. It was everything you could ask and more! Superbe endroit tres propre et charmant. Nous avons eu l'occasion de voir des toucans sur la propri�t� et plusieurs autres oiseaux magnifiques.... C'est un endroit intime avec belle v�g�tation. Les hotes ont �t� tres gentils et accueillants. Merci pour tout! Kerstin and Udo were amazing hosts! We arrived later than expected and it was dark but thankfully they provided very thorough directions, getting around Costa Rica at night can be challenging. The pictures don't do it justice. I really like how efficient and environmentally sound the Orange House is. The open living space, the view, the bathroom, the pool, all my favorites. A cellphone is provided during your stay which was very helpful when making dinner reservations. And a family of toucans visited us on our last day there, that was a nice send off. If you're looking for a secluded place in the rainforest this is it. And don't forget to try Kerstin's homemade jam! My boyfriend and I loved our stay at the Orange House. From first contact with Kerstin and Udo, they were pleasant and thorough in providing information and directions. Upon arrival, Kerstin greeted us at the gate and showed us to the Orange House and around the grounds. The house was immaculate and truly spectacular. They really thought of every detail, down to a electrical outlet in the safe! Fresh fruit, fresh bread, and homemade jam was left for us along with a fully stocked kitchen, which we were sure to utilize. A binder was provided at the house as well, with information on local restaurants and a list of popular excursions, including phone numbers and a cell phone was provided for our use. Again, they really thought of everything. Our favorite part about the house was the convenience of the location... just a few minutes from the local grocery store, restaurants, a local flea market and only 10-15 mins to Dominical. My personal favorite characteristic of the house was the shower which inside/outside with a permaculture setup. It was absolutely amazing. We would definitely stay here again and recommend it to anyone wholeheartedly. This place is an oasis. The orange house was indescribably beautiful!! We flew into San Jose and rented a 4x4. We used our cellphones for GPS. We also utilized Kerstin's directions. It's hard getting around with no addresses. So be aware of sense of directions. We stayed for our honeymoon. The house was well equipped with a kitchen. We tried not to buy much food because of ants. The open shower-well we loved it!!! It is a very tranquil place. Plants and flowers all around. The hosts do not disturb but we're communicative with us when we needed something. When we arrived the place was clean and Kerstin does a good job of utilizing flowers around the home. They let us use the pool. You could stay in the Orange house and just relax during your stay but we ventured out (website hidden) is an Eco-friendly place and so is the Orange house hosts so learn your organics! Your host will provide you with a gate key. Be careful when closing. I would put gate key in my purse and I think it would accidentally open the gate again after we would leave. Overall. This place is an oasis. I would recommend it to everyone wanting to get away. The Orange House in Uvita was heaven on Earth. 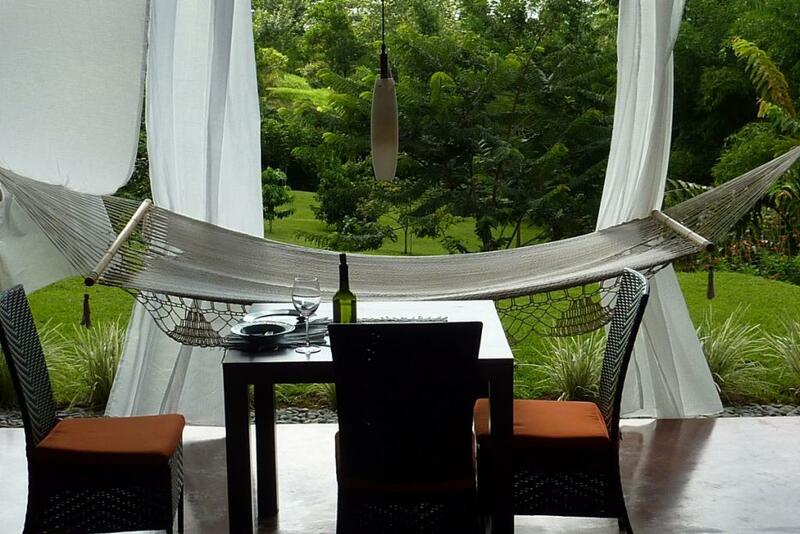 The property was a lush tropical garden, and the villa itself was beautifully designed and extremely comfortable. Kerstin and Udo were model hosts through and through. They thought of everything! They gave us all the privacy we could want, and also made themselves available for any assistance we needed. They even provided an EXTREMELY helpful information folder, with tips, and recommendations for all sorts of local businesses, natural scenery, and activities. The Orange House is a paradise, in one of the most beautiful parts of the country. (And we have traveled over most of it). If you are considering the Pacific side of Costa Rica, look no further, because you will NOT find a nicer place to stay. Kerstin and Udo did a excellent job of making us feel welcome. We arrived a little later than expected and Kerstin was still there to show us around and get us settled. They had fresh fruit, homemade jam and coffee there for us. They supplied us with fresh linen and towels without us even asking for it. If you are looking for a experience different from the typical All inclusive resort type of vacation I would definitely recommend there place. The house is close to all amenities and some amazing beaches. We stayed at the Orange House for our weeklong honeymoon and absolutely loved it! Kerstin and Udo were great hosts, and we'd recommend the Orange House for anyone looking for a secluded nature retreat that's just far enough off the beaten path. The house was clean and breezy, the garden outside the house is beautiful and peaceful, and we were content to just relax there at the house for much of the trip. But there were also plenty of spots to explore nearby including beaches, waterfalls, hiking trails, etc. and grocery stores, banks, and restaurants within easy access as well. Prior to arriving in Costa Rica, we had done a little research but decided to plan out exactly what we wanted to do once we got there. The guidebook with recommendations was so helpful for that. Overall, our stay at the Orange House was perfect, exactly what we were hoping for! Some comments for fellow travelers: After landing in San Jose we rented a 4x4 (with full coverage insurance, which we would definitely recommend considering the driving conditions are bumpy dirt and rock roads once you get off the main road). We also rented a GPS, which was helpful for us since we were unfamiliar with the area. Kerstin and Udo were kind enough to provide us with a prepaid phone for use in Costa Rica once we arrived, which we didn't need to use too much but was nice to have in case. There's a frame above the bed with hooks to hang up your mosquito net (recommended!). Our favorite spot to eat was Ranchos Remo for their full breakfast with an amazing view. The outdoor shower is unlike anything I've ever seen before. The orange house is simple yet elegant and very beautifully designed. The little details make this place very special. The outdoor shower is unlike anything I've ever seen before. We enjoyed our time here and hope to come back again someday. Just a perfect place for un unforgettable moment. A beautiful oasis in a beautiful place. A beautiful oasis in a beautiful place. We started our trip in Uvita wanting to unwind from our busy lives and that's exactly what we did. Well, despite the fact my husband had to work for the first day but the wifi worked well and fast so helped to speed that process along! Kerstin and Udo's Orange house is beautiful, just like the pictures. The architecture so carefully thought out giving spacious relaxing open living. The house is shaded and down a hill from the main house so it is both cool and secluded giving you privacy and respite. We both absolutely adored the outdoor bathroom. Showering on a warm balmy night looking up at the stars accompanied by a distant insect chorus was something really special. There were other lovely touches like the starter breakfast with homemade tropical jam and the information pack, where we tried out the local walk for stunning views over the ocean. We also used the pool on the last day and the views over the gardens and forests were wonderful. We had a great few days and would thoroughly recommend it. 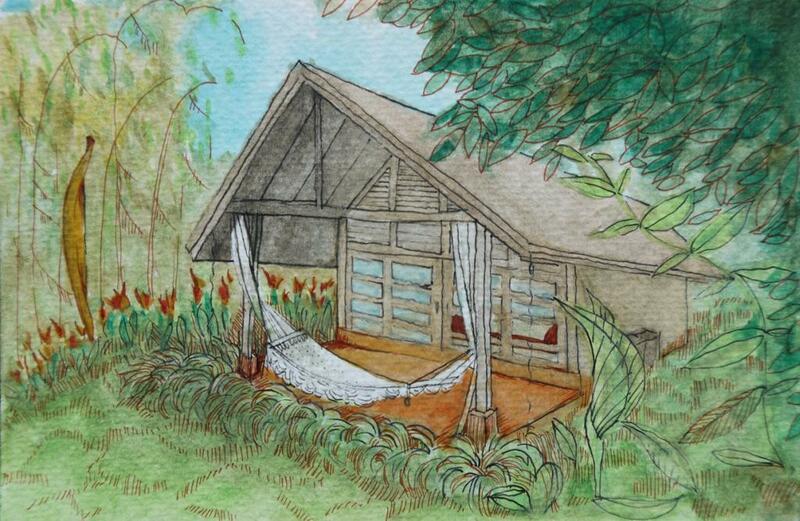 A perfect place to call home for our week exploring Costa Rica. Kerstin & Udo were fantastic hosts. They were very nice and helpful with suggestions for the surrounding area. We loved the Orange House, it was a perfect place to call home for our week exploring Costa Rica. The Orange House was very clean and stocked with everything needed on arrival, include a nice touch of fresh fruit and bread, and homemade tropical fruit jam in the fridge. Overall the Orange House was amazing, comfortable, in a beautiful setting and the bonus of being open air. It was great to open the sliding doors and enjoy the perfect weather, and it offered nice ventilation to keep cool at night. 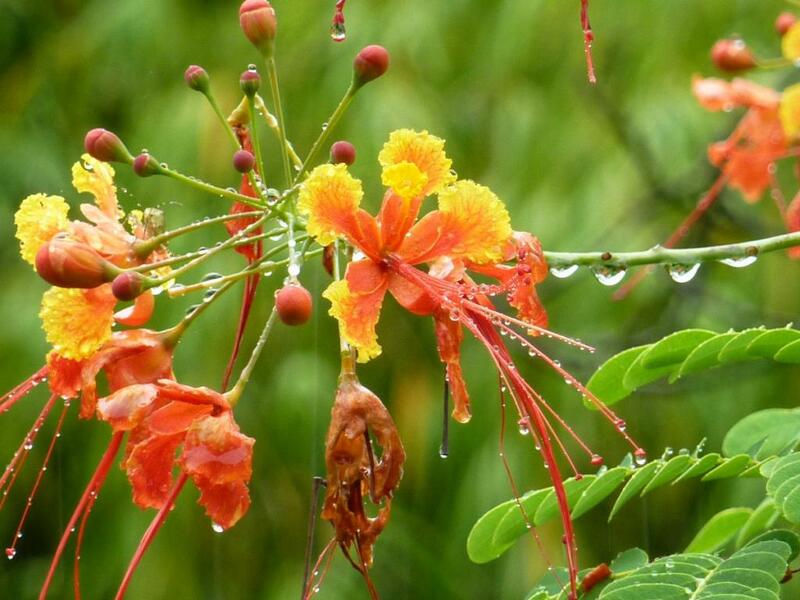 The surrounding property is beautiful, with views of trees, flowers and wildlife including hummingbirds and toucans, among others. The infinity pool was a great place to unwind after days exploring the nearby towns and the small covered deck by the pool was perfect to relax in the shade on particularly hot days. The Orange House is in a great location, with easy access to the beaches of Bahia Ballena, Playa Hermosa, Dominical and many others. There are also a bank, supermarket and other amenities within a short drive. Thanks Kerstin & Udo! My husband and I have just spent the most relaxing and tranquil two week stay at the Orange House over the Christmas/New Year holiday. Kerstin and Udo are charming and discreet hosts. What they have achieved here, returning what was once relatively barren cattle-ranching land back to an ecologically diverse garden filled with native and non-native plants that attract a variety of birds and insects is a joy to behold. It is a little "Eden"' tucked away up an unpaved road and yes less than five minutes' away from all the amenities of Uvita. The praises received from other reviewers are well-deserved. I, for one, will find every other bathroom - no matter how cutting-edge - mundane and ordinary after experiencing their magnificent outdoor shower and sharing it with the odd visiting bird or gecko! The view from the infinity pool across to the surrounding hills is breathtaking and it is a delight to watch the antics of the birds from there at sunset. Typhoon, the guard dog is the most gentle and well-mannered I have ever met. We had planned to do all sorts of excursions during our stay and yet we hardly left the property, so comfortable did we feel. Attention to detail and a sense of pride in what they have achieved here is evident. If you would like to stay in a beautiful hideaway and yet be close to all the restaurants and other amenities, then this is the place for you. We would love to stay here again. Thanks Kerstin and Udo for sharing your exquisite home with us. In short, super highly recommended. We had an amazing time at Kerstin and Udo's beautful house in Uvita. The space is absolutely gorgeous. Kerstin is an architect and designed the house with great style and functionality. There is a heavenly outdoor shower surrounded by flowers and other tropical plants. The sitting and eating areas face a lush garden filled with butterflies and hummingbirds. The place was immaculately clean when we arrived and Udo and Kerstin stocked it with fresh fruit and delicious bread. 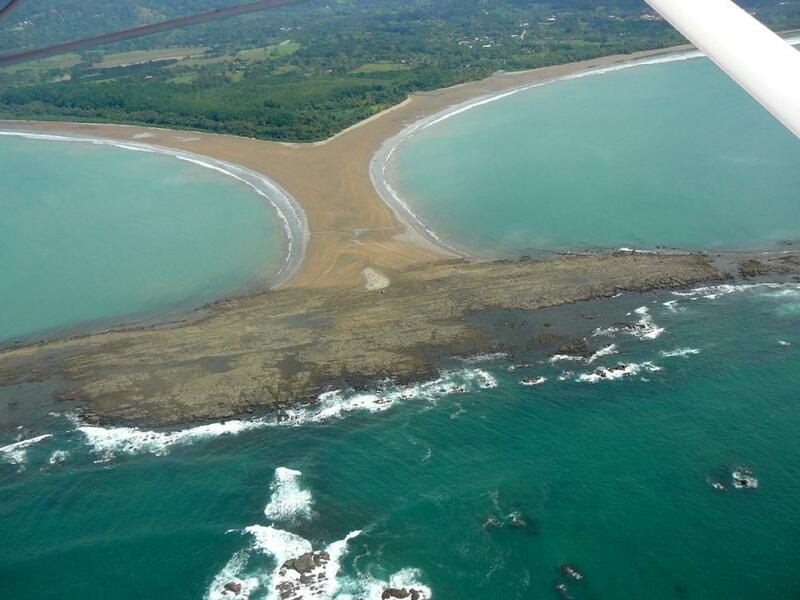 In terms of the location, the beaches of Marino Ballena park are spectacular and deserted. Uvita is a very easy one hour drive to Manuel Antonio, on an excellent road, and a far better place to stay to avoid the crowds. In short, super highly recommended, the best place we stayed in Costa Rica! It was very quiet and peaceful. Great place to be in Uvita, totally in line with our expectation. It was very quiet and peaceful. We profit from the pool, with a beautiful view, and enjoy surfing. This is well located to visit Uvita, Dominical and playa Hermosa. A casa � fabulosa e tem uma vista espectacular para quem aprecia a natureza. N�s ador�mos a nossa estadia na casa da Kerstin e do Udo! A casa � fabulosa e tem uma vista espectacular para quem aprecia a natureza. E � exactamente igual ao descrito nas fotografias! Foram uns bons anfitri�es, deixando-nos � vontade para explorar a propriedade, e deram-nos dicas preciosas para conhecer a zona. 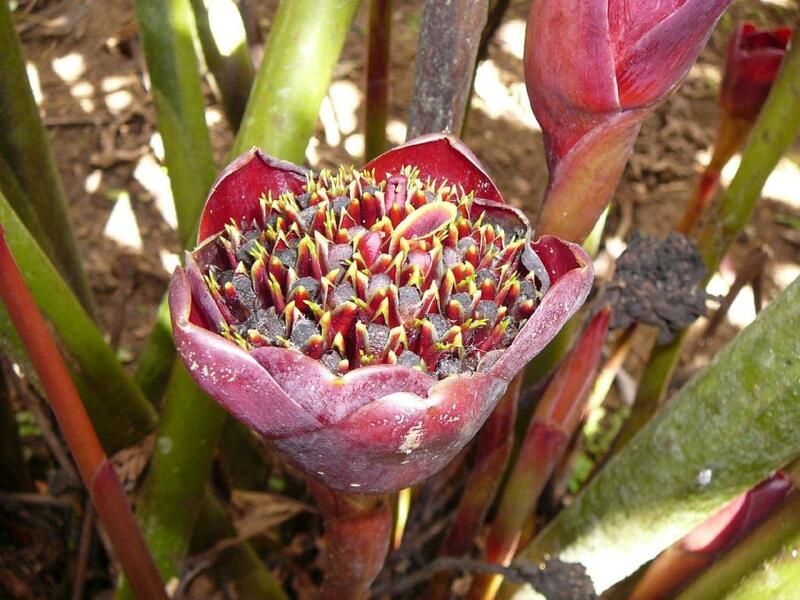 Uvita � uma zona calma e as pessoas s�o amig�veis e prest�veis. Ainda n�o � uma zona super desenvolvida para o turismo, o que � �ptimo para quem quer fugir disso. H� com�rcio e servi�os em todo o lado, que nos permite ter uma estadia confort�vel, sem ser necess�rio fazer v�rios quil�metros para nos abastecermos ou recorrer a uma farm�cia ou ao m�dico. Depois, est� situada numa zona que oferece um leque variado de s�tios a visitar. Aconselhamos a visitarem a reserva ind�gena de Boruca, o Parque Manuel Ant�nio, o Parque Nacional do Corcovado e as praias envolventes. O tour para ver as baleias no pac�fico tamb�m � muito bom. The house was unreal. Like, way better than the photos. My husband and I had the most amazing trip to Costa Rica staying in the orange house. They were such amazing hosts- they had a whole platter of fresh local fruit waiting for us upon arrival along with an informational packet with all the info we could possibly need for our trip. So helpful and nice! The house was unreal. Like, way better than the photos. We loved it so much! The few photos we posted on social media made all our friends ask what "resort" we were staying at! Would definitely recommend-an amazing experience! 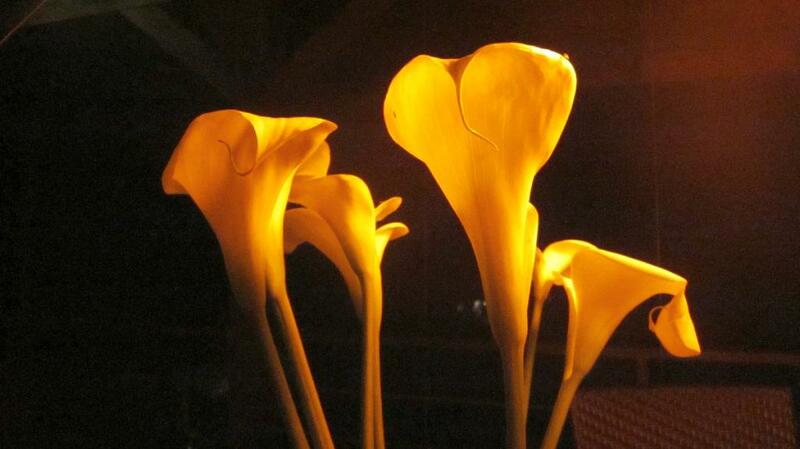 This was a beautiful way to experience a week in Costa Rica, being based at Kerstin and Udo's wonderful guest house. The gardens are lovely and the house with its outdoor bathroom and nearby infinity lap-pool is perfect for an escape from the real world. Nearby towns and beaches offered up endless options for day trips and nights out - but hiring a car is a must - and Manuel Antonio was only an hour away. Thank you for a blissful week. Highly recommended for anyone who wants to get away. Kerstin and Udo's guest home is a beautiful and relaxing place. Highly recommended for anyone who wants to get away. And to top it all off they were such warm, inviting, and helpful hosts from the planning stage to the fresh bread and local fuits they left for us on arrival. I cant say enough about them and their lovely home. wow was this place amazing! Holy wow was this place amazing! As other guests have said, while the pictures are pretty awesome, the actual space is even better. Me and my girlfriend stayed there for 7 days and were sad when we left. Kerstin and Udo are awesome hosts and from the moment we walked in we felt like we were staying at a luxury resort. We were working on our lap tops during the days and the wifi was excellent ( multiple video calls every day ) and the scenery was unbeatable. The kitchen was well stocked with the basics + the provided good coffee. We stayed in 3 different airbnb places during our honeymoon in Costa Rica, and this was by far our favorite. As we read in previous reviews, it is even better than the pictures. The grounds are beautiful, the pool area is pristine, and Kirsten and Udo were perfect hosts. We arrived to find breakfast fixings in the fridge, beautiful fresh cut flowers on our clean linens, and a fresh fruit platter. Our favorite part of the whole place was the outdoor bathroom and shower. The shower is a stone platform set in the middle of a well landscaped, but totally private garden, and it was an absolute treat. We also saw a lot of wildlife, but the space does a great job of keeping out unwanted bugs. Das G�stehaus von Kerstin & Udo ist wirklich ein Juwel. Die Einrichtung und die Ausstattung der K�che lassen kaum W�nsche offen. Das Open-Air Badezimmer und der Pool sind recht Highlights! Kerstin & Udo waren sehr nett und jederzeit ansprechbar. Auch die beiden Haushunde waren gern gesehende "G�ste" auf unserer Terrasse. Eine �u�erst empfehlenswerte Unterkunft! This place was amazing! Like people say, it is better than the photos. So peaceful and serene. You can tell the place is well taken care of and loved! I don't usually like to go back to the same place once I visit (there are just too many places to see) but I would come back here. I was always relaxed and felt at home! It was nice having the built in safe by the closet, and the outdoor bathroom, amazing. Thank you for an amazing way to relax on our honeymoon!!! We had a fantastic stay at Kerstin & Udo's Orange house. It is even nicer than it looks in the pictures if you can imagine! If you're at all considering a trip to this area this is definitely the place to stay. There was a nice welcome basket of fresh fruit, bread, jam, and eggs waiting for us. We really enjoyed watching the sunset from the beautiful infinity pool, seeing hummingbirds and toucans, and spending time in the beautifully designed Orange House. Kerstin & Udo are very friendly and welcoming, they took care of all our needs, we would go back in a heartbeat. We highly recommend this place. We spent a week at the Orange House and the photos cannot possibly do this place justice. It is very clean with beautiful modern d�cor, and was also bigger than expected. 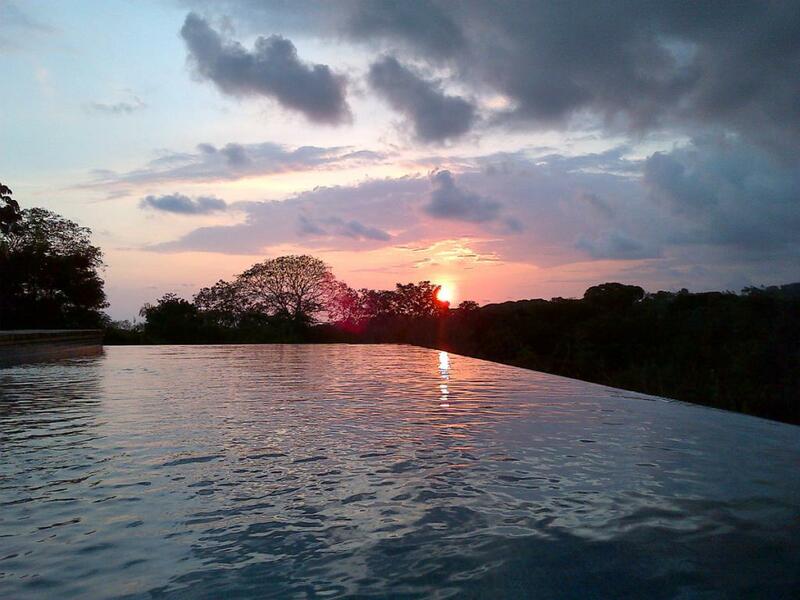 The property is stunning and the pool was a perfect place to enjoy the sunset. Its location close to grocery stores and restaurants is very convenient. Kerstin and Udo are extremely pleasant, helpful people who took great care in ensuring our stay was perfect. We highly recommend the Orange House to anyone. Kerstin & Udo's place is so wonderful that I'm a bit nervous about writing this review as I want to do the Orange House justice. If you read the previous reviews and look at the photos here on their site you will no doubt be taken aback, and accurately so. My husband and I were very excited to arrive in Uvita and spend a week at the Orange House. When we arrived, none of the outstanding reviews or lovely photos can fully capture what they have created. It was paradise for us. The Orange House is simple in nature and with an attention to detail that is very impressive (great closet and storage space, a lock box for your valuables, a personalized guide to the area, a cell phone to make local calls, homemade starfruit jam in the fridge). The design of the sliding doors allowing for open living, watching the sunset from the bed, the outdoor bathroom, the beautiful garden filled with fruit trees, singing birds, blooming flowers, and the sound of the waves crashing below then crawling up into the hills where the house sits...it was a dream for us and we will never forget our stay and we are already figuring out when we can get back. Kerstin & Udo are very friendly and accommodating, but you will not want for anything as everything as already been thought of and taken care of before your arrival. I do have one warning; This place is so special that you might find it hard to leave and go do all the activities that the beautiful area of Uvita has to offer. Kerstin & Udo are the perfect hosts, extremely helpful and respectful--and very thoughtful. There are some very considerate welcome gifts for when you first arrive in the kitchen. :-) The property and the accommodations are beautiful. Just read through some of the other reviews and you will come across words like "paradise" and "magical". I do not think that any of these are exaggerations. It was truly perfect. What I think I appreciated most, is that while the house feels lush and opulent, it is very low impact, efficient and intelligent in its layout and function. It actually is very "green". You will find all the conveniences you can think of, including great internet signal so you can feel connected, as well as other essentials to feel properly pampered--and the pool and gardens are absolutely gorgeous! The surrounding area is also perfect. There is just an endless amount of beaches to explore and discover, each one almost more beautiful than the next. Highly recommended. Best if you have a car, although not entirely necessary. Shopping and restaurants are also easily accessed from the property, although I can't imagine why you would want to leave the house at all. This place is exquisite. The luxurious look and feel of five star accomodations with the privacy and comforts of a flawlessly designed modern home. We ended our honeymoon in the orange house, staying for one week and wishing it could have lasted forever. Seeing the sunset from the king sized bed and showering in the soft rain amongst the tropical flowers felt like a dream. Wandering through the fruit gardens and lounging in a hammock big enough for two. Swimming in a pool all to ourselves that seemed to stretch right into the sky ... It was divine. The tender and subtle gifts that the host provided were so sweet and thoughtful ... Two eggs and homemade bread and jam in the fridge upon our arrival and fragrant flowers atop the towels, which were refreshed twice during our stay. A well-curated handbook of recommended adventures and dining. Each of these offerings were so very appreciated. The hosts were always accessible and met us with smiles and generosity. The town of Uvita was friendly and held some of the most perfect beaches that I have visited in my life .... Many national parks and protected seashores to visit within the hour. I will never forget this beautiful paradise. We feel so lucky to have experienced it. Kerstin and Udo's orange house was a dream come true! I'm still day dreaming about that awesome outdoor bathroom! Although still very private, you are surrounded by beautiful plants and flowers and warming sunshine on your back as you wash up under the shower! Just heaven! When we checked in to the orange house we felt right at home! Very clean and cozy, stocked with fresh home grown fruits! We were also set up with coffee and bread and the most amazing homemade jam that I so wish I could purchase in bulk and have sent to NYC! The pool that is located up on the hill near Kerstin and Udo's house has just the most breathtaking view of the rainforest! It made for a very refreshing energizing swim in the morning! We also got to see so many beautiful butterflies and awesome hummingbirds on a daily basis! You are pretty much one with nature in the house! Our hosts were also so kind to have made a little booklet about Uvita, pointing out all the activities available and beaches to go to! Their directions to the home were also very thorough and made finding the house in a rainstorm very easy! This was our first air bnb experience as well as first out of the country experience and we couldn't have asked for anything better! PURA VIDA! The time we spend in the Orange House was the best holiday we could ever imagine. The beautiful house with a great garden full of trees and flowers invited us to relax the whole day at the awesome pool. On other days we visited quite beaches and fresh rivers + waterfalls located only a few kilometers away. We watched whales and dolphins and many other nice animals. The house is clean and well equipped, the owners are very friendly and helpful. The Rainforest shower in the open bathroom is absolutely amazing! Hopefully we can come back soon. Notre 25i�me anniversaire de mariage dans ce lieu plus que charmant. C'est un endroit inspirant, id�al pour s�journer et r�veiller tous ses sens. Une pure beaut� ,tout a �t� pens� avec go�t, rien n'a �t� laiss� au hasard. Kirstin et Udo sont de jeunes h�tes enthousiastes, dynamiques et d'une aide pr�cieuse pour la d�couverte de cette belle regi�n du pays. Nous conseillons pleinement ce superbe endroit. Absolute paradise! Beautiful sunsets, clean and comfortable living space. Kirsten and Udo are so nice and very respectful of your privacy. The outdoor shower is perfect. You have to check out this property. This place is so unique and peaceful! My boyfriend and I spent 3 nights at the orange house. This place is so unique and peaceful! We had a wonderful time there, enjoying the beautiful pool, the quiet garden, and the stylish little house. We had also everything we need in the house to feel welcomed. (tropical fruits, coffee, jam, bread...) Kerstin & Udo were really nice people as well. We recommend this place for people who wants to find a romantic place spending peaceful time. Loved this place. Gorgeous, artistic decor, eco-friendly construction- from energy conservation and compost bin to the rainwater collection system. The bathroom alone is cool enough to make it worth it- outdoors, with bamboo walls and exotic plants. Beautiful view of mountain jungle canopy with picturesque trees and energizing sunrises. The infinity pool is a serene and peaceful work of art. A great place for lovers of botany, wildlife, or just lovers in general. Super friendly owner couple. And not a bad price for what you get. Do it. My favorite part was the open-air shower! Very cool. My boyfriend and I had a great week-long stay at the Orange House. The house was amazing, and we really enjoyed our time there. The kitchen allowed us to stock up on groceries in town and cook a lot of our meals, and there was with a near-constant breeze flowing through to cool us down from the humidity. My favorite part was the open-air shower! Very cool. Kerstin and Udo were very welcoming and always made sure we had everything we needed, providing driving directions from San Jose to Uvita, information about things to do in town, and even a slice of cake when we first went to hang out at the pool. They really make you feel welcome. I'd go back anytime. Experiencing "life in the jungle", while staying at an exquisite in its beauty, simplicity and functionality house, designed by Kerstin (European architect and owner) was a wonderful journey. With years of experience in the hospitality industry in Costa Rica the owners, Udo and Kerstin provide their guests with seamless service, accommodating the most inquisitive international traveler. The Orange House is ideally situated close to all there is to see in the Uvita and Dominical area and best of all - does not require you rent a 4x4 truck. The house is beautiful in design, functionality and opportunity for effortless living, while enjoying the surrounding nature, sunsets and stunning views of the ocean. It is kept meticulously clean and inviting with a sense of lightness and joy that makes you want to extend your stay indefinitely. Swimming in the pool while watching the sunset is an experience in itself. The property offers daily opportunities for stunning photographs of nature and is a peaceful setting for writing, working or just hanging in a hammock. The natural breeze of the location was incorporated in the open design of the house to provide constant and organic air flow and ventilation that I did not experience anywhere else in the many places I had stayed in Uvita and Dominical. The outdoor shower is just brilliant in idea, execution and experience. My boyfriend and I stayed at the orange house for 4 nights. Kerstin and Udo were really great in being responsive as we set up the trip, and check in/check out went really smoothly. The orange house looks as stylish as promised and feels really new. The kitchen setup was more than sufficient -- thanks to Kerstin and Udo for the groceries to get us started -- and the bed was big and comfortable. The porch and hammock was great for relaxing in the morning. The pool is really nice and well-maintained. Thanks for the nice accommodations, Kerstin and Udo. Tourist tips: We loved seeing the wildlife at Manuel Antonio park and we had a GREAT surfing lessons with the Bohdi surf school. I highly recommend them. We spent our 10 day honeymoon at Uvitalonghouse and had an excellent time! We would definitely recommend it if you love nature and privacy and nice home to stay at. The house was truly beautiful, clean and well equipped, and everything was taken care of by the owners. The ventilation system was very well designed, despite no air conditioner the temperature was pleasently cool. The amazing beaches, jungle, restaurants and supermarket were all close by. Kerstin and Udo were very helpful and friendly. The information booklet about Uvita and the region they had put together was excellent. We thoroughly enjoyed the stay at Uvitalonghouse and would recommend it to our best friends. The Uvita Long House was far and above our expectations. Upon arrival it was as though exhaling for the very first time. Just a tad off the beaten path, this home is far from this world. The kindness of Kerstin and Udo as we arrived was very welcoming. The serenity and overall sense of well being is just amazing. There are many great day getaways very close by, secluded beaches, hikes, mangrove tours and dolphin/whale watching. All of which were great additions. Be aware though, once you get to this beautiful little paradise it is hard to leave. Do yourself a favor and don't! Take a whole day to relax, lounge in the hammock, poolside and just breathe. We did, and will definitely visit again. It is the second time in 2011 (first time during Eastern) that I had been at the lovely Orange Guesthouse of Kerstin and Udo! The hosts are of extreme kindness and very pleasant in any context combined with all the guidance, discretion & privacy you might need. The architecture of the Longhouse (owners) and the Orange House are of a rare beauty and are just to be admired once you see them in a phantastic garden and environment with spectacular views in the mountains - especially when foggy clouds and the howlers can be heard. The accessability to the Orange House is more than great and short from the main coastal road without adventure to get lost in the mountains. The area with lovely beaches and other attractions is unbeatable. My favourite time: sit on the terrace (or lay on the daytime coach) - drink a glass of wine - look in the area - listen to the birds - let the soul walk around - be just happy to have had the luck to meet Kerstin & Udo! Do you assume that I would like to come back asap? The Orange House is one of the most peaceful places I have ever been. Perfect for a couple who looks for a get-away but at the same time want to have easy access to the main tourist attraction as there are pristine beaches and a variety of adventure tours. I highly recommend. The studio house was spacious and well equipped, and the sounds of the jungle at night are a real treat. 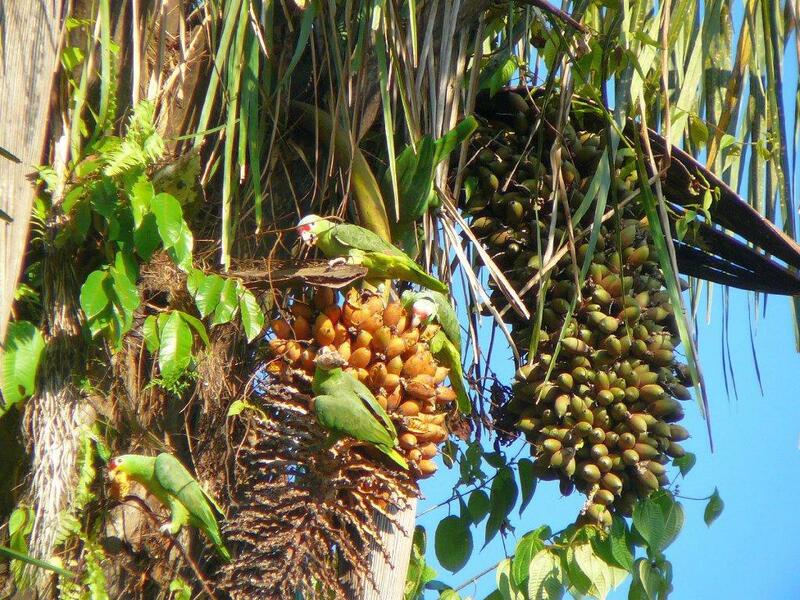 Toucans and parrots fill the air with their sounds each morning and evening. We loved the openness and modern character of the house and especially the garden bathroom is an experience worth having. Kristin and Udo were there anytime we needed. Kind and helpful but not invasive in any way. I would come back in an instant and it will be really hard to leave. It is definitely one of, if not the nicest place I've stayed in. My husband and I spent nine days at the Orange House for our honeymoon and absolutely loved it. The house is beautiful and very well-equipped. Furthermore, Kerstin and Udo were excellent hosts, always making sure we were enjoying ourselves and giving us numerous tips on activities, restaurants (all of which were fantastic) and the like. The house is private and quiet -- a great place to relax, and the pool is just lovely. We would recommend the Orange House to anyone wanting to get off the grid and unwind in a beautiful setting, and will definitely stay there again one day! I have been more than lucky on a Sunday night in Washington to have checked the vrbo website as a last minute action and could not believe what I found as a new advertisement with excellent descriptions, marvellous architecture and a brilliant website which Kerstin & Udo submitted the next day. I am travelling since 35 years and put this rental paradise Orange House in my top ranking in any context, which is also confirmed by my 2 sons from Munich who joined me during their Easter holidays. The surroundings, the garden, the pool, the outdoor bath, the waves on lovely beaches in the Uvita area and the very pleasant and discrete hosts are just incredible. I recommend this little paradise with all my heart and hope personally to come back asap. The pictures do not do it justice! 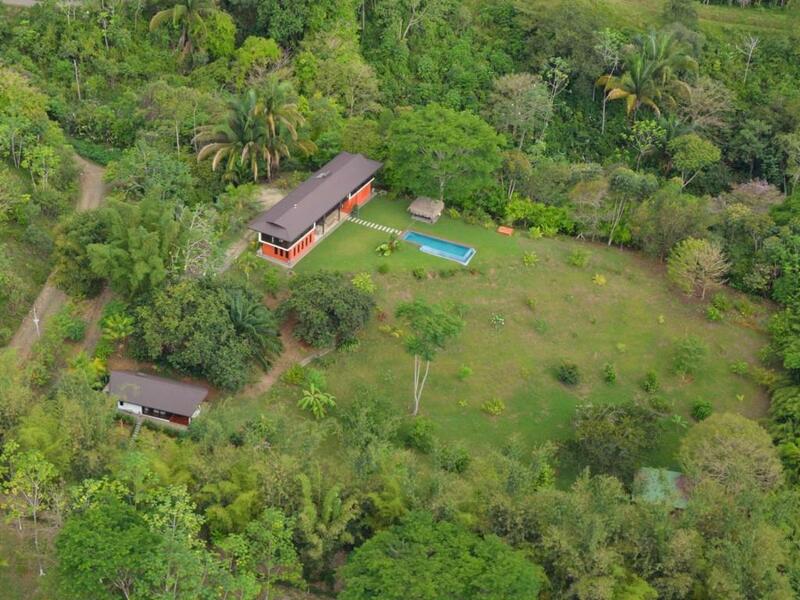 The Orange House is a modern and extraordinary designed home surrounded by a lush garden in a jungle setting. The natural beauty of the outdoors and the tastefully decorated interior become one. Our mornings were awakened with the sounds of the jungle, Toucans and various exotic birds. Don't miss to go to the beach in the early morning with low tide, it's a spectacular atmosphere and only a few minutes away by car. Relaxing by the infinity pool, relishing the peaceful view to the ocean and jungle mountains was the perfect escape. We will be back! Staying at this beautiful and very well maintained house was a relaxing and fun experience. Nature surrounding the house is wonderful, we had the opportunity to see toucans in the property trees as well as a flock of scarlet macaws flying over a huge Guanacaste tree. The nearby beaches and waterfalls, amazing! The owners were very kind and helpful at every moment, they also provide a detailed information folder and maps of the area in the house. Thank you!! We really enjoyed our stay very much.